← What Has Done More to Improve Living Standards: Indoor Toilets, Air-conditioning, or Smart Phones? “Personalized learning” joins “disrupted” and “transform” as popular hyped words used by policymakers, entrepreneurs, superintendents, online enthusiasts, and wannabe reformers. As with the other catch-phrases, “personalized learning” means different things to different people (see here, here, and here). What all do share is a commitment to another often-hyped but less attractive phrase: “competency-based learning” or individualized mastery learning that has nearly a half-century of experience in U.S. schools. Now, with digital tools available and a climate hostile to the “factory-system of schooling”, the capacity to convert “personalized” learning into daily school work has spread. So, no surprise that when “personalized learning” is translated into practice, the concept appears in different forms. Rocketship schools, AltSchool, Agora Cyber School, and the rural Lindsay Unified School District in California’s Central Valley blazon their “personalized learning” (or “competency-based learning”) placard for all to see. It is a marketplace where different brands compete for the shopper’s attention. Within this branding competition sits Teach To One. On May 15, 2016, I spent an hour and a half shadowing Lupe (a pseudonym), an eighth grade student at ASCEND charter school** in Oakland where she and about 100 classmates (sixth graders were on a field trip) received their daily math instruction through Teach To One. The Director of Teach To One, Winona Bassett (a pseudonym) briefed me on the first-year program, answered a number of questions I had and found the student I would shadow. She explained to me the different “modalities” I would see during the morning. The student’s answer to these Exit Slip questions each day determines what the student will work on the following one. All Exit Slips are sent electronically to New York City, graded, and “using, ” in the Director’s words, “algorithms and human judgment,” the next day’s Exit Slip is sent back within hours to the director and teachers of the program. Through accessing the Portal, students then know what they will work on the next day and whether or not they are progressing or regressing (or mastered) each skill. All math skills are aligned with Common Core standards in a highly flexible physical environment unlike a traditional classroom. The physical space. Taking over the school’s library, the large space is demarcated into four separate rooms each with a sign of a local university (e.g., San Jose State, San Francisco State). Each room is designed with Teach To One space consultants. 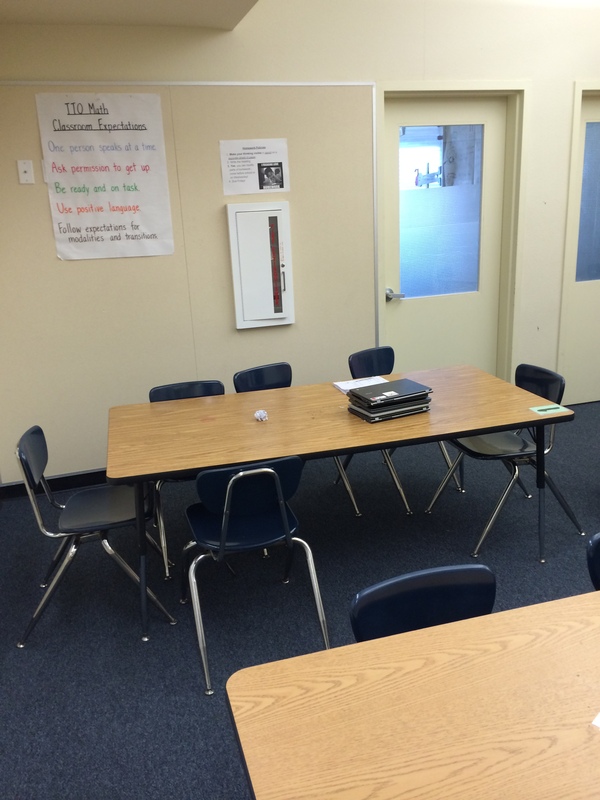 has long tables–each movable chair clearly numbered–capable of seating up to six students. There is much noise from different segments of the room since library shelving units separate the spaces. Students, teachers, and aides went about their business amid ebb and flow of sound across the divided space. One space is used for a teacher-directed lesson on scientific notation (see below), another space is used for students to use their Chromebooks to work on the individually designed lesson on scientific notation (based on their results of work the previous day recorded on their online Exit Slip–see below); the third space is for collaborative work between and among students and teachers. The fourth space is used for a teacher-directed lesson on circumference. This morning, the seventh and eighth graders are distributed between the four “rooms” spending a half-hour in each space before moving on to the next “modality.” For each segment of the 90-minute class, students sit at different tables with different classmates. The students. Ages 13-14, these seventh and eighth graders, mostly Latino boys and girls (see demography of ASCEND below) range in size from large to pint-sized, exhibiting varying stages of puberty. They are filled with energy, zest, and seriousness mixed with playfulness. As an old white man on a cane, I stand out among them and when I sit at a table next to the student I am shadowing, many ask my name and what I am doing there. I tell them that I am shadowing Lupe and will write about the class on my blog. I tell them my name and one student yells out: “Larry, the Cable Guy.” The name sticks as I move from one “modality” to another. As I observe them in each “modality,” I see students using their Chromebooks and reading from the screen and writing in a large notebook. There is much back-and-forth between students about the task they were working on and playful kidding with each other as they exchange information about friends, how each looked. etc. The teachers. For the 50 students there this morning, there are two credentialed teachers and two teaching assistants. I watched both teachers in their different spaces for 30 minute periods. Chimes ring during the 90 minutes they take math signaling students when to switch “modalities”(e.g., go from 10-minute Math Advisory–like a “homeroom”–to a teacher-directed lesson, etc.) and when they must complete their Exit Slip, and when they move to their next ASCEND class. The first teacher I observe is doing what the program calls “Live Investigation.” An experienced teacher, Julia Kerr (a pseudonym) has 10 students at three tables. For 30 minutes she conducts a recitation/whole group discussion/Q & A on converting standard notation to scientific notation. She begins with a matrix of four cells on the whiteboard, each cell holding the following symbols: +, -, x, ÷ . Students open their notebooks and draw the matrix. She then asks students: “what are the rules when we add decimals?” She calls on students by name. At my table, there are two boys and two girls. They have their Chromebooks open and have taken out their notebooks and pens. As they exchange information and gossip, they move easily between Spanish and English. One of the boys is a big, non-stop talker who prods the much shorter, slight boy with jokes and comments about others in the class. The smaller boy laughs but hardly responds back. The two girls say nothing to the larger boy’s comments. The teacher who scans the class constantly sees what is happening and admonishes the boy by name. He quiets down and returns to his Chromebook and notebook. Teacher moves through each cell of matrix giving examples and asking students by name to respond to her questions about how to convert standard to scientific notation. They use their calculators on the Chromebook and move easily back and forth between paper and screen. As she walks around, students show her their screens and notes they have taken. I asked Lupe what she got out of the class. She told me that Ms. Kerr helped her understand better what scientific notation is. She will use her notes when she works on her Exit Slip. When I asked if she can convert standard to scientific notation, she paused, hesitated, and murmured something I could not hear. She smiled and we went to the next class. In this “modality,” Lupe and classmates will work individually in their Chromebooks, consult their notebook, ask veteran teacher Donald Percy (pseudonym) questions about scientific notation that they are stuck on. There are 24 students in the room. They open their Chromebooks and notebooks. Most dig right into the task. Some are clearly stuck. Percy sees this whether they raise their hands for help or not. He moves easily in and around the tables, questioning a student, making suggestions, and going to white board to show what a student is stuck on and what the student needs to do. At my table there is one boy and four girls. The boy cracks jokes and one girl occasionally laughs. He is working from another sheet of paper and answering questions on paper. It is his “Independent Practice” handout. 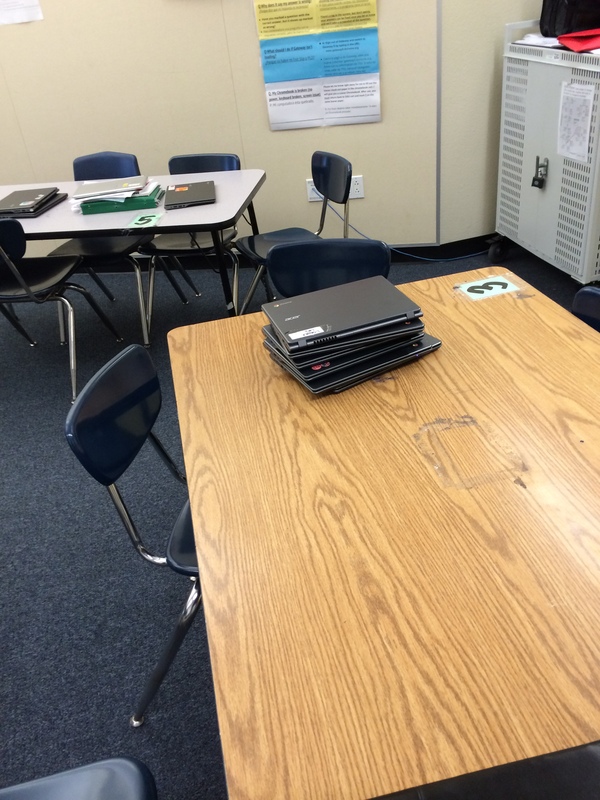 While some students who work at Independent Practice use Chromebooks for their handouts, some do not. I learn later from the Director of the program that he is having a very hard time with previous skills and the current scientific notation. The girls at my table generally ignore him and proceed to move back-and-forth from notebook to Chromebook. Percy works with three boys at another table who need help. He goes to the whiteboard and writes down examples, explaining how to go from standard to scientific notation. Chimes ring signaling that everyone transitions back to 10-minute Math Advisories to complete there Exit Slip. Those at my table begin doing so. Quiet descends in the room. Students click away on the questions they have to answer, given where they are in mastering the skill. Some consult their notebooks. Before the chimes ring, the teacher praises the entire group for their diligent work and then asks students as they leave to plug in their Chromebooks to recharge them. They do. In a few minutes, this session ends and students move to their next ASCEND class. I met with the Director to debrief. I was curious about the switching between paper and screen and she explained that this was a teacher decision, not a company one, since teachers wanted a record, “evidence” was the word she used, that staff could assess and then compare what they see on paper with students’ progress through the competency-based math curriculum via Exit Slips. She explained to me the rapid electronic turnaround between New York City servers and staff, Teach To One accessibility to distant staff, and the ups-and-down of being a first year program. Her enthusiasm was infectious and I thanked her for setting up the shadowing of a student. *Joel Rose, one of the founders of School of One who joined with Christopher Rush to start-up New Classrooms, contacted me in March 2016. He wanted to discuss Teach To One with me. We met for coffee talking about his vision of schooling, “personalized learning,” and his work in expanding New Classrooms. Afterwards, I asked him if he could arrange my visiting its Oakland Unified School District site in ASCEND charter school. He did. **ASCEND is a Oakland public charter school that opened in 2001. The charter serves 430 students in grades K-8 with 24 students in every class. Students are 80% Latino, 8% Asian, 6% African American, 5% Multi-Racial, and 1% Filipino (2015). Poverty rate in school, determined by number of students eligible for free and reduced price lunch, is 95 percent (2013). ***the classroom disciplinary policy is ASCEND’s. Verbal warning first. Then with another violation, name goes on whiteboard. Next time a check mark next to name. After two check marks, detention, and with three check marks, student goes to principal. I learned this from the student I shadowed and classmates. None of the students knew of anyone who had been ejected from their math class. I only looked at the math program for 6th-8th grade that Ascend had contracted with Teach To One. I did not attend other classes or observe other than passing through the school. Thanks, Laura, for the comment. and the calculations that go into the ratings. The website is, among other things, a way to redline communities, steer parents/caregivers to specific schools, and sell products to website visitors whose information can be purchased for a fee…and is, by Zillow among many others. Thanks, Laura, for the Great Schools formula and the Ascend data. I had not seen that. Teach to One has been a disaster for students, see http://www.mv-voice.com/news/2017/01/05/parents-up-in-arms-over-digital-math-program for details on how a Silicon Valley community is up in arms following implementation of TTO in their community. Thanks for the comment and link to the article. It was shocking for me how shoddy their implementation is once you start looking under the hood! Of course personalized learning sounds great but what they do is glue together without much care materials chosen from a large number of vendors. That material is of varying quality but rarely rises to the level of Khan Academy which is free. I have seen mathematical falsehoods presented in these materials (e.g. Sample % = Population %, with no caveats), answer keys with incorrect answers and Exit tickets (end of day exams used by New Classrooms to determine understanding of skills) with no correct answers. They required that our district sign a non-disparagement clause (contrary to the CA Education code) muzzling any negative comments and provide everything on an “as-is” no warranty basis. Thus you can take everything New Classrooms says as pure marketing hype.